Brothers is a simple game that probably won't satisfy a more serious pair of gamers, but is perfectly tuned for younger players or as a very accessible intro to the mechanics of a tile laying game. Brothers by Ankama is a simple tile-laying game that tells the story of two brothers fighting over how best to run their farm. One brother wants to raise rabbit-like creatures called Wabbits and the other prefers Gobballs which look an awful lot like sheep. 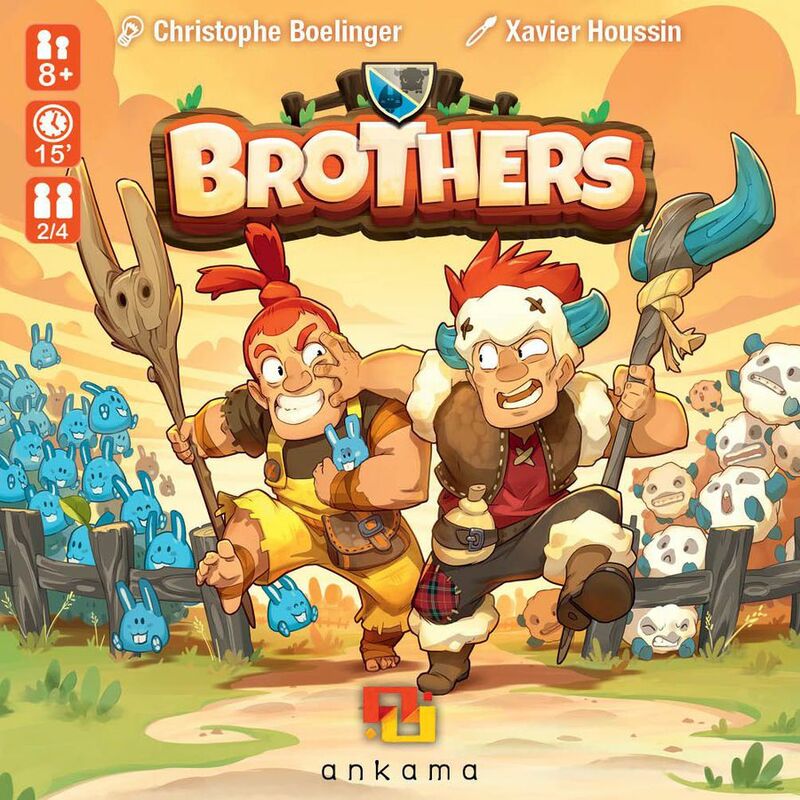 Gameosity was provided a review copy of Brothers by Ankama. We were not otherwise compensated for this review. Jess: This family squabbling reminds me a lot of some of of reviewers arguing over how their board game libraries should be organized and let me tell you it can get quite heated. Jess: We should reorganize the collection by primary box color. Andrew: YOU MONSTER!!! THERE’S NO WAY THAT…oh. Jess: I rest my case. Anyhoo, like I said, Brothers is all about tile laying. Each player will side with one of the two brothers (or, at 4 players, you’ll split into teams of 2) At the beginning of the round players will take turns placing Meadow tiles to form the farm. Once the farm is completed everyone will take turns placing their Wabbit/Gobballs tiles. Tiles must be placed on the meadow and cannot overlap other tiles nor hang off the edge of the meadow. 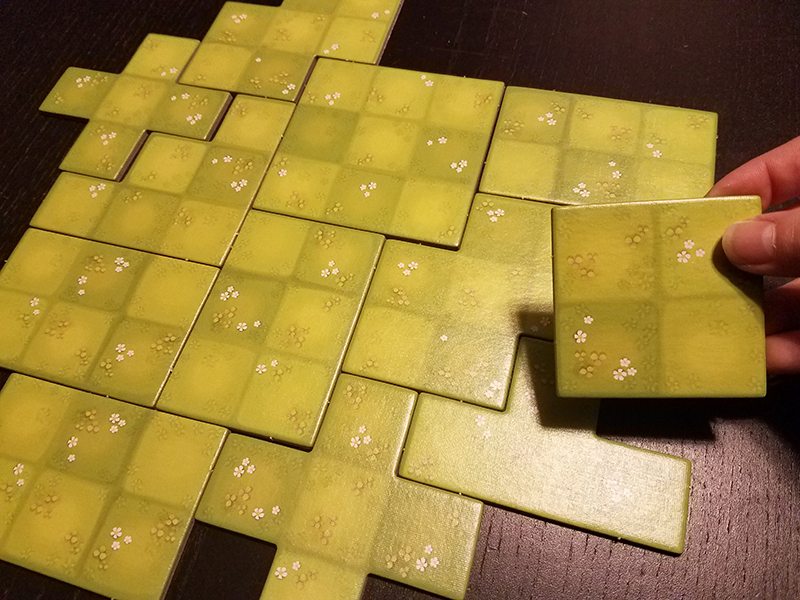 Once you cannot place anymore tiles on the meadow, scoring beings. Every tile you couldn’t place will score you points, which is a bad thing since it’s the lowest score that will win. Every Wabbit tile left over equals 1 point and every Gobball tile equals 2 points. 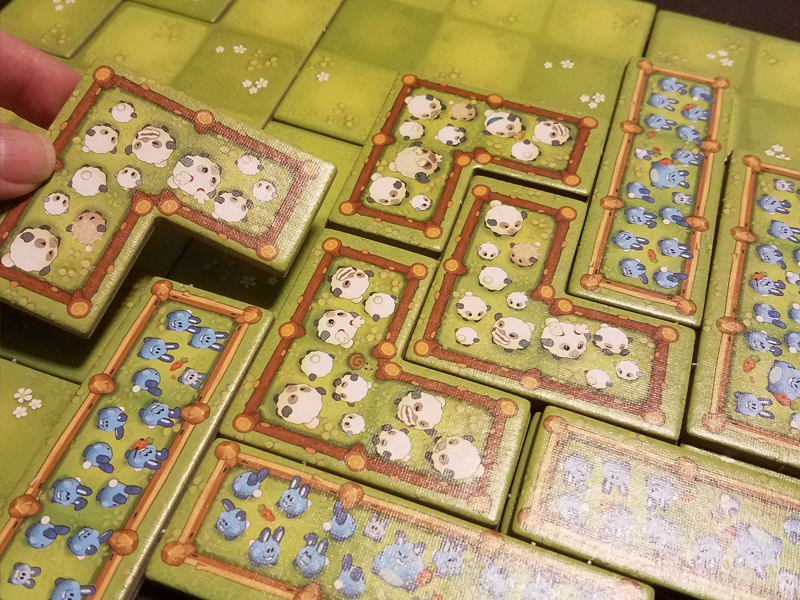 After the first round of scoring, the game resets and players will then switch which tiles they are placing – if you placed Wabbits in the first round, you’ll be herding Gobballs in the second. After this second round, players add up their scores from the two and the one with the lowest total wins! 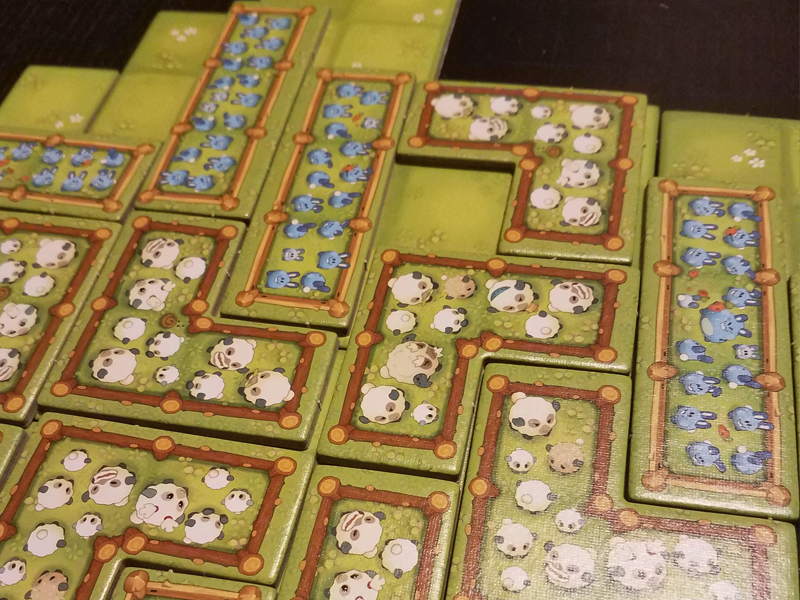 Andrew: So Brothers is really all about placement efficiency – you’re trying to arrange the board in such a manner that your tiles will fit best, and of course you’ll want to place your herds such that you mess with your opponent’s ability to do the same. Jess: And that’s really all there is to Brothers. It’s a very light game, making it perfectly accessible for younger players. I don’t think it had quite enough substance for us to really dig into it, but the structure makes it really quick to learn and play, and that’s a great thing for the game’s weight. Andrew: Agreed on all points – what makes it especially effective as a game for younger players, I think, is how both players play both sides over the course of the game. There’s an intrinsic fairness to that which I really appreciated. Jess: Plus, it’s small and light enough to basically go anywhere your younger gamers have enough table real estate to set it up! So if you’re looking for something young gamers might enjoy, or want a game to introduce new players to the idea of tile laying games, Brothers is definitely worth a look! You can pick up a copy of Brothers from Ankama’s Online Shop.